This piece was commissioned by Andrew Thomas Parry, a British artist living and working in Berlin. Parry approached me in May 2016 after his own research into foam insulating panels led him, inexorably, to Slab. 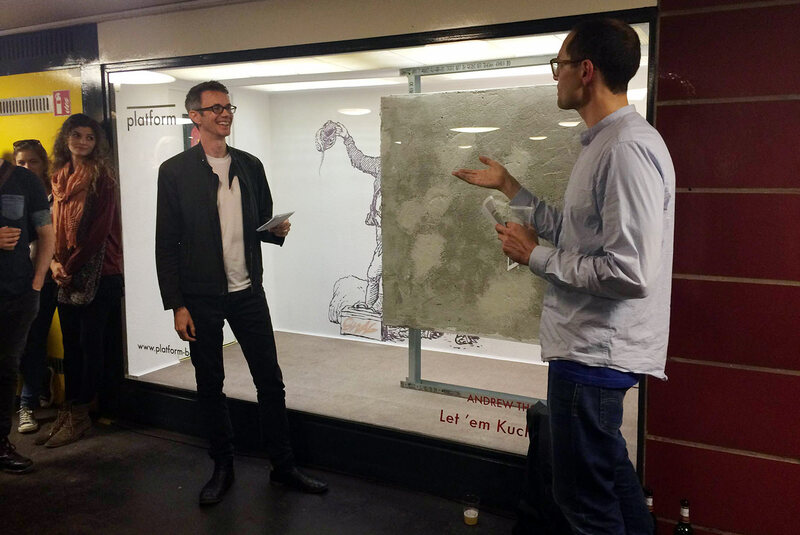 The text accompanied an installation entitled “Let ’em Kuchen essen”, which was exhibited in the Platform art-space, a vitrine in the Kleistpark metro station. 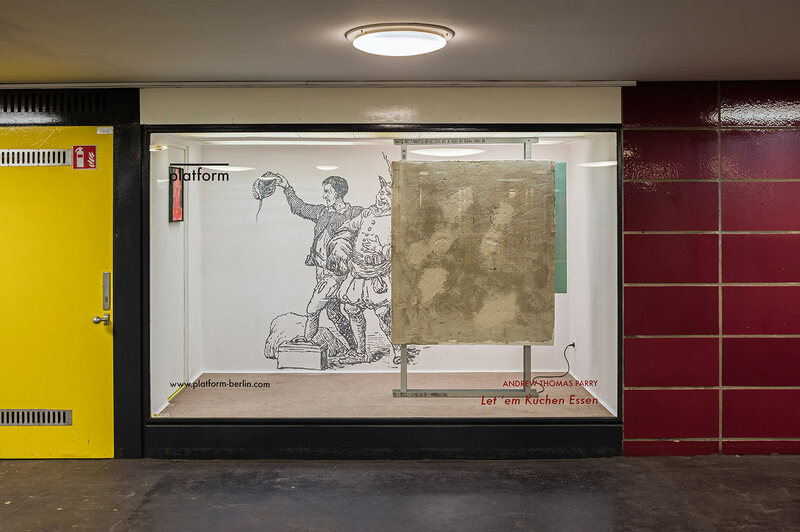 Parry’s installation is a social critique of Germany’s ongoing federal subsidisation of façade insulation, which is often used by property owners as a mechanism to increase rents prices. In the urban imaginary, foam proffers itself as an allegorical narrative of social mobility. Foam is a useful metaphor for a specific expression of material wealth typified by a fetishistic appreciation of reductive aesthetics, as well as a tangible substance inherent to the fabric of our built environment and our culinary conventions. In the multi-scaled system of foam we find the bubble as its smallest unit. Intrinsic to the lifespan of a bubble are gentle inflation and rapid collapse. In bubble economies, asset price inflation combined with unbridled credit expansion precede the crash. A single bubble might burst violently, but the steady depletion of foam soothes us with the promise of a soft landing. Foam’s abundance is a structural antidote laced with our desires. The proliferation of the latte macchiato as a ritualistic medium through which to celebrate modest luxury permeates the urban econoculinary landscape. The rise of the neoliberal market economy – overlapping the second and third-wave coffee movements – was ushered in by the two-decade, bugle-call, background howl of the espresso-machine steam-wand. The latte macchiato’s emblematic ascent coincides with the exponential growth of Starbucks following the end of the Thatcher-Reagan era. When company stock began trading on Nasdaq in 1992, the chain had 195 stores. Twenty years later, there were over 17,000. Writing in 1998, New York Times food columnist Molly O’Neill described late Michelin 3-stared chef Alain Chapel’s foamy mushroom cappuccino as “legendary”. Significantly – for analogies with late-capitalism – she frames the frothing of soups as a “subversive act, a way of blurring the distinction between the light and the heavy, the austere and the indulgent.” More recently, molecular gastronomist Adrià Ferran inadvertently helped to whip foam into the mainstream where it has since sagged into an aspirational cliché of more pedestrian eateries. It is in the soufflé, however, that we find the embodiment of mastery over the inflation and collapse of textured hydrocolloids. First recorded in the early 1700s, the soufflé was developed and popularised by Marie-Antoine Carême 100 years later. Abandoned by his parents during the French Revolution, Carême apprenticed as a pâtissier close to the Palais-Royal neighbourhood in Paris, where post-revolutionary high-society congregated. He rose to fame after opening his own pâtisserie, where he regularly astonished the public with spectacular pièces montées in the shop window. 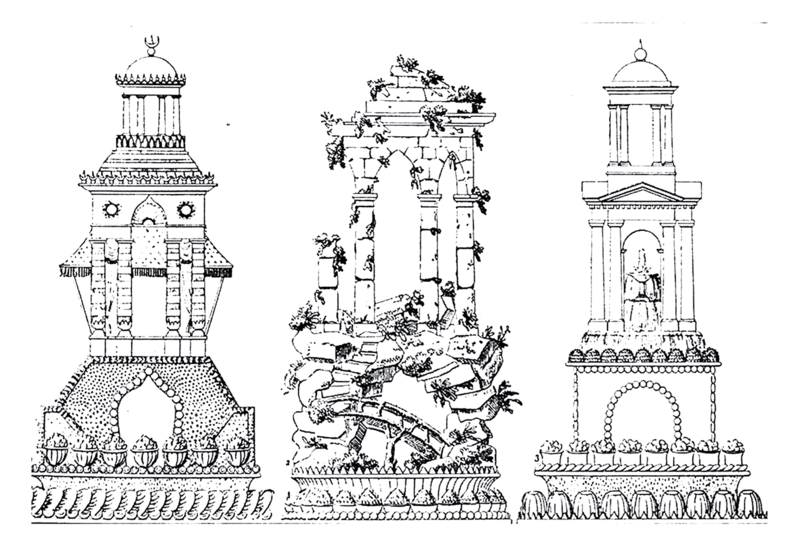 These creations, made entirely of marzipan, sugar and pastry, were towering structures which mimicked architectural motifs: tiered pyramids, arches, turrets, domes and porticos. Contemporary domestic architectures (another kind of pâtissier’s confection), with their smeared surface layers of coagulated polymer goos, are complicit in the swindle of the light masquerading as the heavy. Historical buildings, meanwhile, are coerced into the opposite: the seductive idea of indulgent austerity, heaviness rendered light by effervescent financial mechanisms. Subsidised foam cladding ostensibly addresses environmental concerns, but is also the driver of asset price inflation by passing on the remaining costs to those already ascendent on the socio-economic soufflé, and forcing aside those who are not. Profits swell on the back of a bubble. As a sign of a certain kind of spirituality, foam, noted semiotician Roland Barthes, “has the reputation of being able to make something out of nothing, a large surface of effects out of a small volume of causes”. Andrew Thomas Parry, Leah Peschel, Lucy Olivia Smith and Timo Ohler.